There is a double warning in an advertisement by Hartford Funds in the July-August 2016 issue of Bloomberg Markets. First, the disclaimer cautions investors that things don’t always work out as hoped. Proofreading by humans still matters. That’s one of my, er, principles. © 2016 Johnson Strategic Communications Inc.
A few years ago an investor relations colleague told me Twitter was “the end of the world as we know it.” Bothered by the cacophony of 140-character mini-messages, this Old Schooler was offended by the damage that tweeting could inflict on our language. To me, it looked interesting rather than scary. And now Twitter, Inc., after a hugely successful IPO on Thursday that raised roughly $2 billion (which The New York Times DealBook blog sniffed was “more modest” than what the company might have gotten if pricing had been higher), is going to be even more interesting for IR people to watch. The social media platform has begun life as a public company pledging to talk to investors through – well, social media. To be sure, there is a Twitter investor relations webpage, though I found the corporate site only after some searching. 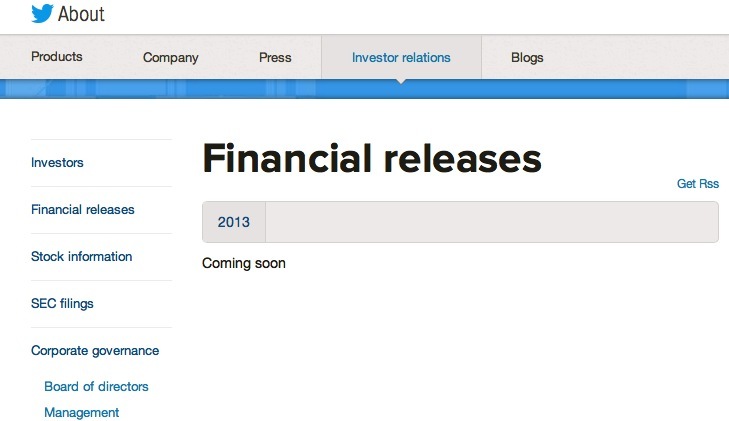 The IR page itself is worth checking out, a bit unconventional with its news from the company blog of mostly non-investor related happenings, a page of financial releases (“Coming soon” … like the earnings, a cynic would say) and, of course, a feed from @twitter. Investors, the media and others should note that, following the completion of this offering, we intend to announce material information to the public through filings with the Securities and Exchange Commission, or the SEC, our corporate blog at blog.twitter.com, the investor relations page on our website, press releases, public conference calls and webcasts. We also intend to announce information regarding us and our business, operating results, financial condition and other matters through Tweets on the following Twitter accounts: @dickc, @twitter and @twitterIR. The information that is tweeted by the foregoing Twitter accounts could be deemed to be material information. As such, we encourage investors, the media and others to follow the Twitter accounts listed above and to review the information tweeted by such accounts. Any updates to the list of Twitter accounts through which we will announce information will be posted on the investor relations page on our website. That all seems to be in line with the SEC’s guidance on IR use of social media and company websites for disclosure (speaking as a non-lawyer). Twitter has the advantage of starting afresh – investors aren’t accustomed to seeing its news in one particular place or format. The end of the world? Hardly – but IROs will be watching with interest. Reg FD: Does $50,000 get your attention? In the old days, companies sometimes tried to soften the shock of bad news by getting on the phone with key analysts to tweak their assumptions, whether on this quarter’s earnings or another issue. A Regulation FD case against an IRO, resolved Friday by the Securities and Exchange Commission, sends a clear message: The old days are over. Here’s my non-lawyer version of what Reg FD says to IROs: When things are changing in ways that may be material for shareholders, don’t think about “signaling” or “telegraphing” the market by talking to a few analysts and investors. Instead, broadly disclose the changes through a news release, 8-K filing, or conference call open to all investors. Selective disclosure is out, fair disclosure is in – that’s been true at least since Reg FD took effect in 2000. The recent SEC case involves Lawrence Polizzotto, former head of investor relations for First Solar, Inc., an Arizona firm whose financing was part of the political controversy a couple of years ago over Energy Department loans to renewable energy companies. On Friday, Polizzotto agreed to pay a $50,000 penalty in the selective disclosure case and accepted a cease-and-desist order with the SEC, without admitting guilt. Polizzotto violated Regulation FD during one-on-one phone conversations with approximately 20 sell-side analysts and institutional investors on Sept. 21, 2011 – the day after a Congressional committee sent a letter to the Energy Department inquiring about its loan guarantee program and the status of conditional commitments, including three involving First Solar. This Congressional line of inquiry caused concern within the solar industry about whether the Energy Department would be able to move forward with its conditional commitments. Analysts began issuing research reports about the Congressional inquiry, and analysts and investors began calling Polizzotto. Despite knowing that the company had not yet publicly disclosed anything, Polizzotto drafted several talking points that effectively signaled that First Solar would not receive one of the three loan guarantees. His talking points emphasized the high probability of receiving two of the loan guarantees and the low probability of receiving the third. Polizzotto delivered his talking points in the one-on-one calls with analysts and institutional investors, and he directed a subordinate to do the same. Polizzotto went even further than his talking points when he told at least one analyst and one institutional investor that if they wanted to be conservative, they should assume that First Solar would not receive one of the loan guarantees. So there it is: material nonpublic information. The proof of materiality is that, when First Solar learned of the one-on-one disclosures and issued a press release the next day, its stock dropped 6 percent. If you want guidance on Regulation FD or its application, ask your securities counsel. You can read Reg FD here, see the Polizzotto order here or explore links on the SEC’s selective disclosure webpage. In the “Things Could Be Worse Department,” an investor relations nightmare struck Google Inc. today: Not only did third-quarter 2012 earnings decline and miss expectations, an unfinished draft of GOOG’s Q3 release was filed prematurely on the SEC’s EDGAR website, triggering a big sell-off before trading was halted. Oh, yes, pretty dire. GOOG closed down 8% on nearly five times average volume, a haircut of about $20 billion for shareholders. No telling whether the stock price would have reacted as violently if bad earnings had been released in a more orderly way – say, after the market closed. So Google is the lead news story on all the financial sites – with headlines like “Google results, filed by mistake, miss; shares dive” (Reuters), and “Live: the Google Earnings Disaster” (live blogging on WSJ.com). And, of course, the tribulations are even trending No. 1 on Google Finance. It will take time to sort out what all went wrong. Google blamed the early release on R.R. Donnelley, the financial printer that does a lot digital work for IR departments. No doubt there will be further statements and explanations. For now, what is certain is that “Google – October 18, 2012” will become a case study for investor relations officers in the future. 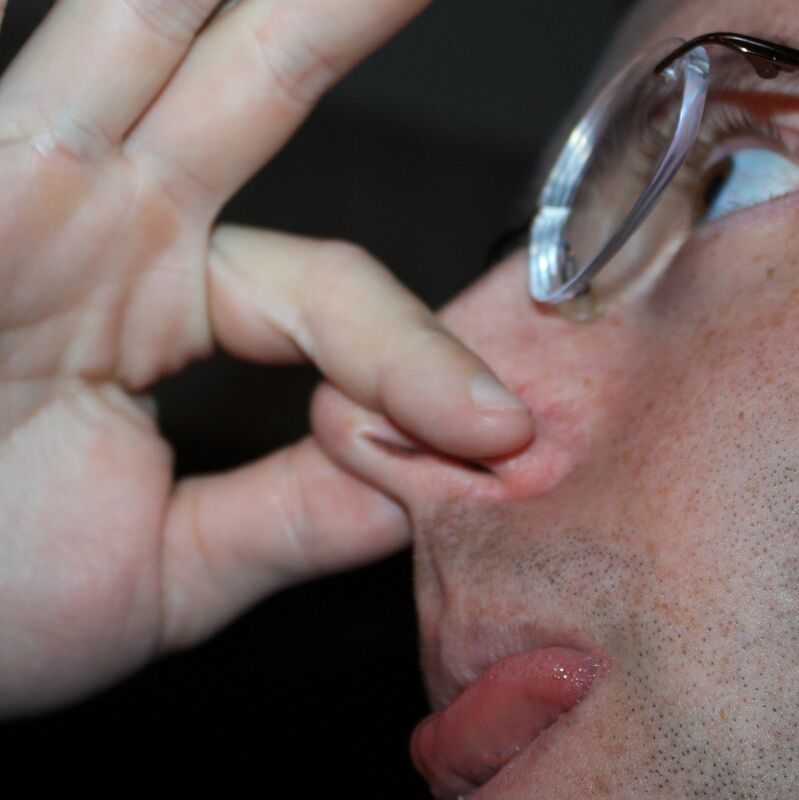 A case of what not to do. Facebook faced issues with its IPO – including a brouhaha over the analysts for Morgan Stanley and three other underwriters lowering their estimates in the middle of FB’s road show. Some commentators call for SEC regulations to require investment banks running IPOs to disclose their analysts’ opinions broadly, not just to their favorite institutional investors. Something about a level playing field. Reuters says Facebook told the analysts they’d better bring down their revenue and earnings forecasts, a wink-and-nod sort of investor relations not regarded as acceptable in recent years. Something about Regulation FD. People care because the IPO lost its sizzle on the very first day, then dropped further. FB shares closed this week 16% below the IPO price. The Financial Times has a good narrative. Poor Wall Street. Poor Mark Zuckerberg. Poor speculators. The hounds of the plaintiffs’ bar are in full chase, of course, barking loudly and threatening in all directions. The SEC and Congress are investigating. As a high-impact disclosure issue, this will be one to watch. JPMorgan Chase continued to convulse over its trading loss of $2 billion, or is it $3 billion, or … whatever the amount, reputational damage exceeds the financial loss. The disclosure (or lack of disclosure) of the risks JPMorgan and its “London whale” were taking – and the losses they incurred. IR people should take a close look and consider how we would treat similar setbacks in our companies. Corporate governance concerns came to a boil over doubts about the JPM board’s risk-policy committee and whether it had the right stuff to actually oversee risk for what is, basically, a huge global risk-taking machine. Washington stalwarts, once again, are calling for new laws and regulations to codify the good sense that the old laws and regulations haven’t quite brought about. And we’ll be treated to the spectacle soon of Jamie Dimon going before Congressional panels to be used as a prop for politicians’ campaign videos. Oh, well. General Motors filed an amendment to its proxy statement today noting that it “recently learned” of a related party transaction last year that it hadn’t disclosed. GM says CFO Dan Ammann’s wife is a partner and COO of an advertising agency that got about $600,000 from a GM subsidiary in 2011 – and he didn’t know about it, so it wasn’t in the proxy. The deal was reported in AdWeek last fall, according to the Detroit Free Press, but apparently the $600K eluded the proxy writers. Oops. You have to read way down into the story to find that AP’s sample included only S&P 500 companies, the largest cap companies in the U.S. market. Actually, AP had data from only 322 that had filed proxy statements through April 30. The other 7,000-plus publicly listed companies in the United States? Not part of the study. The AP headline might have said: “Large-cap CEOs made $9.6 million …” As it is, politicians trading on Joe Sixpack’s envy will just run with the anti-CEO broadside. And companies will deal with the widespread assumption that CEOs and other execs are paid too much. Investor relations pros need to focus on providing the real numbers and explaining – in plain English, not legalese – why pay is what it is. What’s wrong with this company? A contrarian approach to messaging for investor relations is to ask yourself, “What’s wrong with this company?” Then, in IR reports and presentations, address the weak points of your business – what causes investors to turn up their noses – along with your solutions. This offbeat idea was prompted by an interview with Anne Gudefin, a stock picker involved in Pimco’s growing presence in the equity markets, in Fortune‘s May 23, 2011, issue. She is a value investor, and like many I’ve talked to Gudefin is looking for stocks that are beaten down – but have upside potential. I also want to see things that aren’t operating perfectly at the moment, so there’s a margin for improvement. I look for there to be a number of catalysts for value to be unlocked. … During the second quarter of last year we bought BP. Because everyone was so negative about it, we were able to buy very good assets at a very cheap price. Like many on the buy side, Gudefin is looking for companies with a “catalyst for change.” If something’s wrong, the value-oriented investor sees upside potential. Sure, IR usually focuses on a company’s strengths – great products, competitive advantages, 24-carat gold balance sheet, smart management. We love bar graphs that show a powerful uptrend. We recite accomplishments of each quarter or year. Spell out the challenge. Describe the problem objectively, as investors and analysts are likely to see it. Show a capacity for humility, even self-criticism. Define a solution. Emphasize your strategy for solving the problem. The more tangible the actions you lay out, the more you overcome investors’ doubt. Track your progress. Check off actions as you take them. Quantify the progress. Investors will be convinced after a quarter or two of positive results. Being transparent about problems has drawbacks, of course. Some challenges are tough, they may stretch over several quarters, and you may report a disappointing lack of progress at some stage – or even have to change the strategy. Think of the really good questions investors sometimes ask. Why are sales flat in your XYZ division? Your gross margin is underperforming these peer companies – how are you addressing that? What business issue keeps you awake at night? What’s important is that you recognize what is holding back your company’s value and explain to investors that you are implementing a plan to solve that problem. The goal is improving performance that unlock the value for shareholders. What do you think? Any tips on IR reporting on business problems? As an investor relations person, I love this time of year. I enjoy working on clients’ year-end reporting, of course – but it’s also a time when I get to experience IR from the other side, as a member of the audience. Believe me when I say I am a small shareholder of a few companies (not of any clients, by the way – a separate issue). But when the mail brings an annual report, proxy statement and voting materials, I love it! I dive into those reports, to review companies’ performance and see what they’ve done in the way of presentation. And I vote my proxies, as a believer in letting management know where I stand. Let me share an example: the annual report in two pieces. Not dramatic or unique … but offering two pieces strikes me as a good solution. 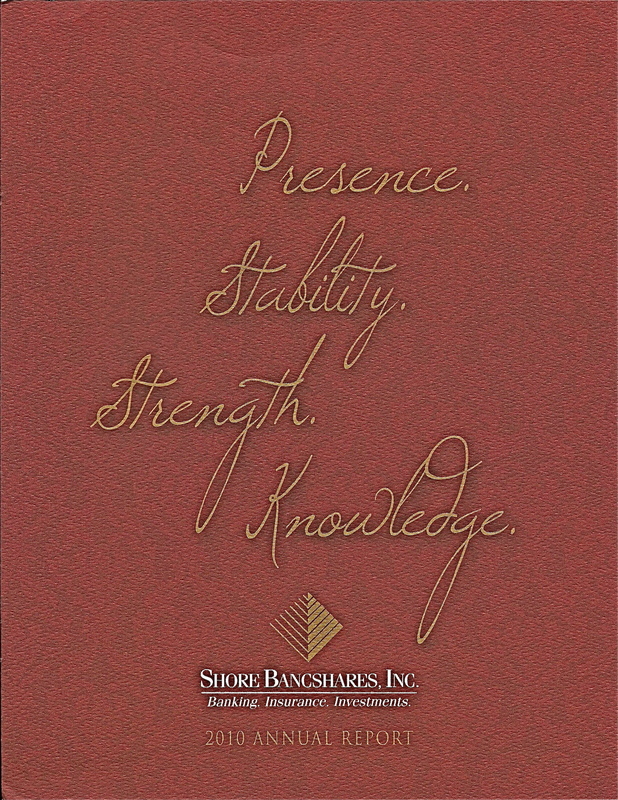 The Shore “marketing” annual report, 8 bound pages all on cover stock, has one page of financial highlights and graphs, a 2-page shareholder letter, a page of locations with maps of the market, board and officer lists and an large photo of the board arranged around antique furniture, and contact info for the banks and insurance offices. The cover says Presence. Stability. Strength. Knowledge. Well, OK. The 10-K, of course, provides data on competitive position in each of the markets, six and a half pages on risks, revenue and expense breakouts, detail on the assets and issues in the loan portfolio, and so on. It’s red meat for the shareholders. The marketing version is perfect for a coffee table in a bank branch, another accessory to make customers feel comfortable banking there. The 10-K is not so reassuring for the lay person but useful for investors deciding to buy, hold or sell. Banks are classic examples of companies whose annual reports have at least two audiences: shareholders or potential investors on the one hand, and customers on the other. Bank customers may see the annual report as an assurance of security for their money, though we might hope the FDIC provides even more solid backing. The other day I walked into my own bank, in Kansas City, and there was a stack of glossy new 2010 annual reports. I picked one up, of course. But this one, a front section and 10-K bound together, ran 160 pages – really overkill for my needs as a depositor. As a bank customer, if I see assets are substantial and the bank has earnings – and maybe a photo assures me the officers or board members are not motorcycle gang members – I’m OK with leaving my money in that bank. An investor needs the details. So here’s an idea: If your annual report is serving two different audiences, one approach is to print it in two pieces – send both to shareholders, and give the summary version to customers, vendors and employees. They don’t give Pulitzer prizes for earnings releases. Or annual reports. Or conference call scripts. But if public companies were to be judged on efforts to communicate with investors, the judges’ list of criteria would surely include clarity. The top three standards might be accuracy, timeliness and clarity. This is the stuff of investor relations. And after all, investors do judge companies’ efforts to communicate – in the market. I was reminded of this core mission for IR by a collection of articles on CEOs in the third-quarter issue of NYSE Magazine. In one piece Bill McNabb, Chairman and CEO of Vanguard Group, is asked what today’s shareholders want most. Shareholders are looking for CEOs to have an increased focus on clarity; they want to be able to understand the numbers and put them into perspective. The less clarity around off-balance-sheet activity, the higher the hurdle rate for the investment manager to get comfortable with what’s going on at a company. As an IR practitioner, I would say our job is to be clear rather than to bury people in numbers or legalisms or “sunshine in a bottle” optimism. The goal is for investors to understand the business, its performance and market position. Clarity – I like that! 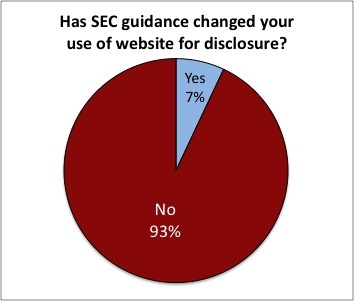 Nearly two years after the SEC issued guidance on use of company websites for disclosure, a survey of investor relations professionals by the National Investor Relations Institute (NIRI) reports few have changed their web disclosure practices. The essence of the SEC guidance, carrying out then-Chairman Chris Cox’s agenda to bring disclosure methods into the 21st Century, was to let companies know they can establish their websites as the place for investors to find material news. That set off speculation (and some advocacy) that companies would stop issuing press releases and possibly abandon other channels of disclosure. It hasn’t happened. To be sure, more companies are encouraging investors to visit their websites – building the email alert lists through the sites, putting the web address on all materials, issuing advisory releases to direct people to the sites, and the like. About 90% of the respondents file 8-Ks and issue news releases through paid wire services to get material news out to the market. (The IROs reported median annual cost of $25,000 for issuing press releases.) After those two channels come conference calls, email alerts, RSS feeds and social media. 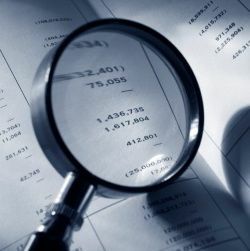 Google Inc. (NASDAQ: GOOG) has released its first quarter 2010 financial results. 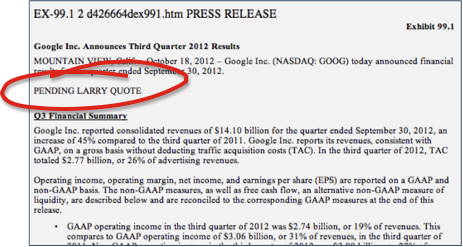 Please visit Google’s investor relations website at http://investor.google.com to view the earnings release. Google intends to make future announcements regarding its financial performance exclusively through its investor relations website. Google’s move stirred some controversy. Reuters clucked that this “unorthodox” approach “raises questions.” Dominic Jones of IR Web Report sprang to GOOG’s defense and went after Reuters. I’ve heard other IR people give varying opinions. My feeling? Google can do whatever it wants, of course. 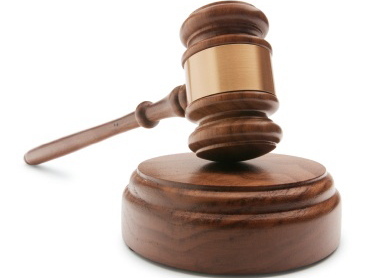 I view company news more from a communication standpoint than a legal one. For most companies, the goal should be to reach as many investors and other stakeholders as possible with earnings or another announcement. I would add channels, not cut them off. At this stage, having your press release feed automatically into Bloomberg screens, Yahoo! Finance and all those other channels (even Google search) seems desirable. Transparency includes making it easy to find your information. Requiring an investor to visit your website, adding clicks to the process, or pushing more people to read news filtered through reporters for Reuters or Bloomberg, seems limiting. I’m all for robust websites. As I’ve said before (see “The website: your front door”), IROs should view a company site as the potential investor’s entry point to engage the business. We should evaluate the experience a person has approaching that front door – and benchmark how we do providing information, creating impressions and inviting interaction. Ease of use and transparency should characterize a website. But the site isn’t the only channel. What’s your opinion on the place of websites in good disclosure? Comment below.